Make these your new home safety initiatives. Congratulations, New Homeowner! You successfully navigated the web of paperwork, finances, and inspections and came out with the keys to your new home. The hardest feat is done, but responsible homeownership doesn’t stop there. Setting your home up for safety is more than just locking the door when you pop out to the shops. When you move into a new apartment or house, don’t let safety fall wayside. Here are the top tips that every new homeowner shouldn’t forget! Renew the locks – You don’t know who, or how many people, the past homeowner gave keys to. Don’t risk it – change your locks as soon as you move in to prevent these people from having easy access to your home. Also, remember to reconfigure your garage door code. Add a home security system – A home security system notifies you and authorities if suspicious activity occurs, ensuring that your home is secure whether you’re at home, down the road, or out of out the country. Check the smoke and carbon monoxide detectors – Check these alarms to ensure that they’re in working order. These features all play a part of your family’s ongoing wellbeing and safety. Don’t drill into walls with wires – Hanging shelves, closet doors, and art pieces mean that you’re drilling into your walls. Walls house plumbing pipes, ductwork, wires, and cables. Stud sensors are able to detect changings in density to sniff out studs, cables, and ducts. However, always take care when drilling into walls – even if the sensor says it’s all clear. Secure homeowners insurance – Homeowners insurance is designed to protect your home in the event of a disaster. Doesn’t your humble home need the protection it deserves? 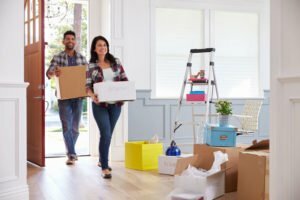 Contact McCarty Insurance Agency to get started on the right policy for your new home and needs in Fresno and areas of California.